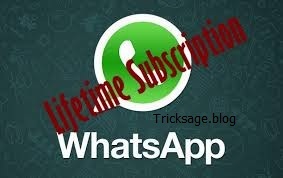 After a long time tricksage is back with powerful tricks and as earlier i post same topic but that time its for ios and now it for all using ios ,,,,and as you all know Whatsapp is free for 1 year and after 1 year they will charge you, but this trick will help you to use whatsapp for 10 years. lets see how, just follow the below steps. 1. First you need to Delete you WhatsApp Account from your Phone. 3. Then you need to Register WhatsApp with your Number on his Iphone or Ipad. 5. After these Steps WhatsApp will load and Start on Iphone, just Check WhatsApp Account and it will have Paid Subscription will 2023. Final Step: By this You have got Paid WhatsApp Subscription till10 years. Now you Simple Need to Delete your Account from Iphone/Ipad. and Simply Then downlaod the WhatsApp on Any Device which it supports and Enter your Number then verify It. you will see you have got 10 Years of WhatsApp Free.